I did find a 89 Grand Prix in a yard a week ago but that's it. Everything else seems to be 2nd and 3rd gen cars, especially Pontiac. No 1st gen Cutlass or Regal. I'm guessing they were all crushed long ago. Makes me sad. That will be a sweet Ride Jiggity76 I am also new to the site and so far everyone that i have talked with is Awesome and full Of great Info. Cant wait to see what this becomes!!!!! Thanks! I like your ride as burgundy is my favorite color. I don't know why I haven't mentioned this before but I use to have a 2006 Grand Prix GXP that was burgundy. I wish I never sold it, bought it brand new and the V8 was quick! My buddy use to have a 2001 Grand Prix that was identical to yours but was silver with black interior. He had the same rims as yours and yes they are factory alloys. I think they are more rare than the silver and chrome star wheels that most cars had so maybe you should keep them in the garage even if you swap to aftermarkets. His car was totaled in a hail storm and he really misses it now. Anyway, welcome and I've kind of rambled on here. Thanks jiggity76 this is my first wbody and love the color! Wow, how'd I miss this thread? I can't wait to see what it looks like after a good bath inside and out. I have the weirdest craving to want to clean that car right now...lol. Welcome to the site, excited to see the progress! Any photos of the GMC you're working on? I'm looking forward to really scrubbing her up! Might have to have the interior professionally done since it's really bad but I think I can handle the outside part. I have some extra time this coming Tuesday so I will get some pics of my GMC on here. 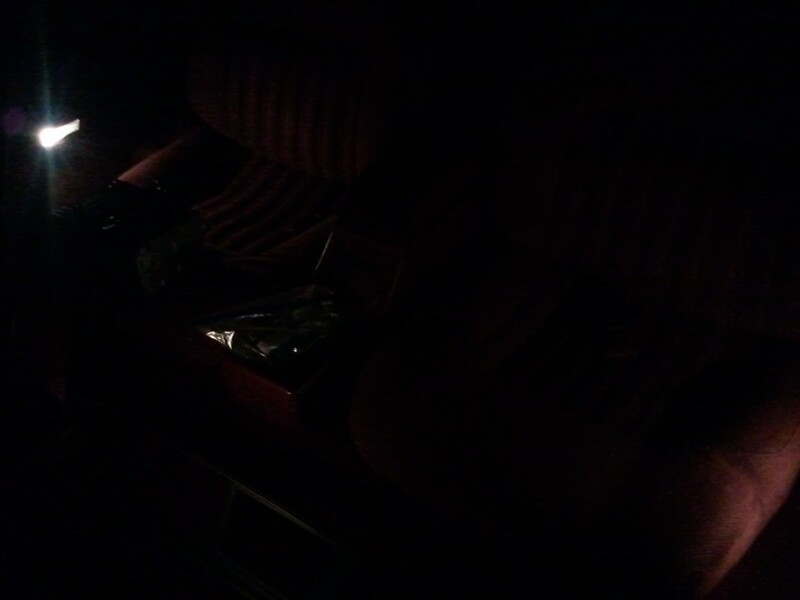 There's 3 versions of the LQ1. 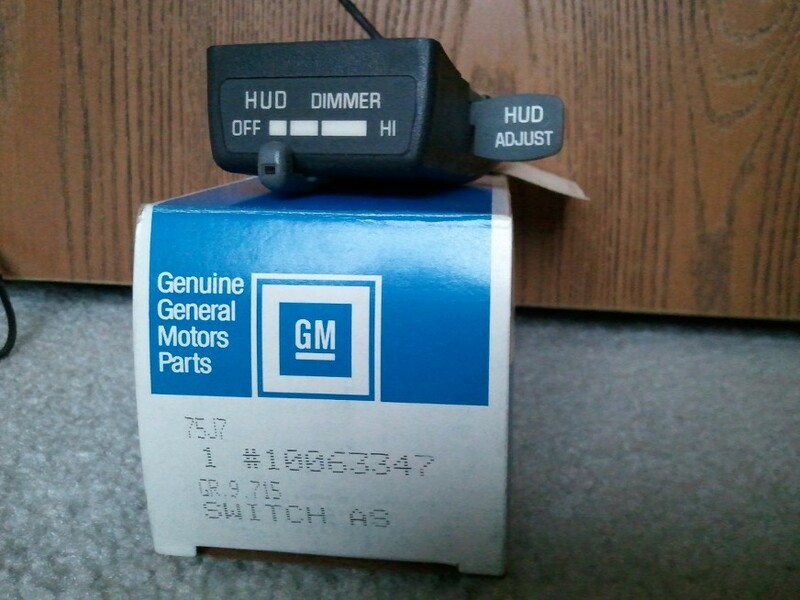 The 1st one is OBD1 compliant and doesn't have a cam sensor IIRC, They were made from 1991 to 1993. The 2nd one that is ODB 1.5 and does have a cam sensor as well as other new sensors, those were made in 94 and 95 and the ODB2 compliant interference LQ1 which was made in 96 and 97. 1995MY was the last year of the non interference design. 1996 started a new plenum, removable throttle body and interference design. The change was to boost up power, not sure why or how making it an interference engine helped that feat and the sad part is that it was only for a 5hp and 5tq gain. Ask questions and we can answer them. We're nuts for these cars sadly. I've said this in another thread but some of us have more than one W and some of us have only driven W since we got our licenses. I sadly have 2 W's.... with the same engine which doesn't make it any better. Thanks for the great info. I would have never known any of this unless if I hadn't found this site. So I guess having a early LQ1 is kind of good. Less sensors and if something happens, the motor won't destroy itself. My understanding is that early gen LQ1's are rare especially in the Cutlass cars. Then if the belt breaks on a '93 LQ1 passing six grand the engine will not grenade ? That is really good to know. Since the service records show that the belt was changed fifteen years and 55,000 miles ago, I have been reluctant to take over four and feels like that is where it starts to go. Guess 9.5:1 compression and .390" lift is enough for non-interference. 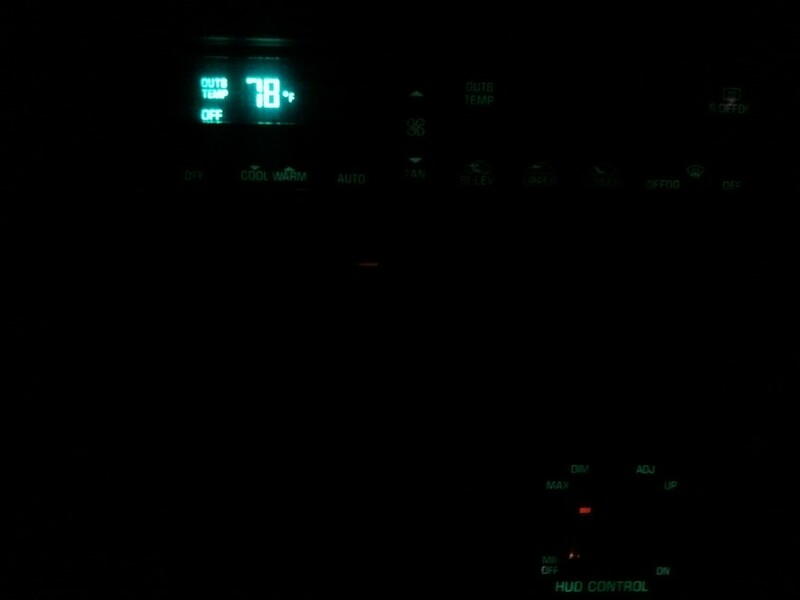 Also the FSM indicate the belt is not "old" until past 70,000 miles. Did get a Delco 1808A sender and will see if that makes the gauge show pressure and not just be a switch. Yeah, this site is pretty good for LQ1 info. Only other place that would be a good source for LQ1 info is the Fiero forum, they like to use the LQ1 in their cars. I've actually seen one of em make a custom intake for their LQ1. All LQ1 cars are rare now. 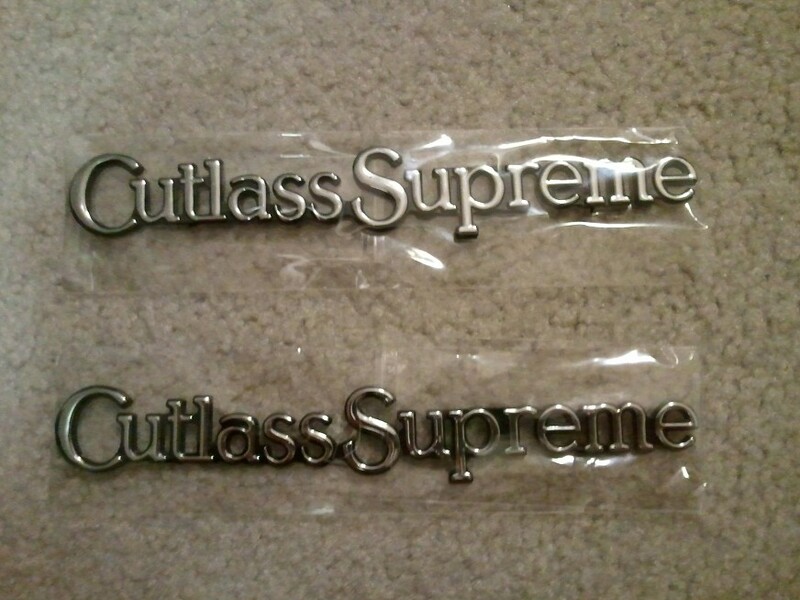 Z34s, GTPs, Cutlass Supremes. It shouldn't but there's always a possibility. 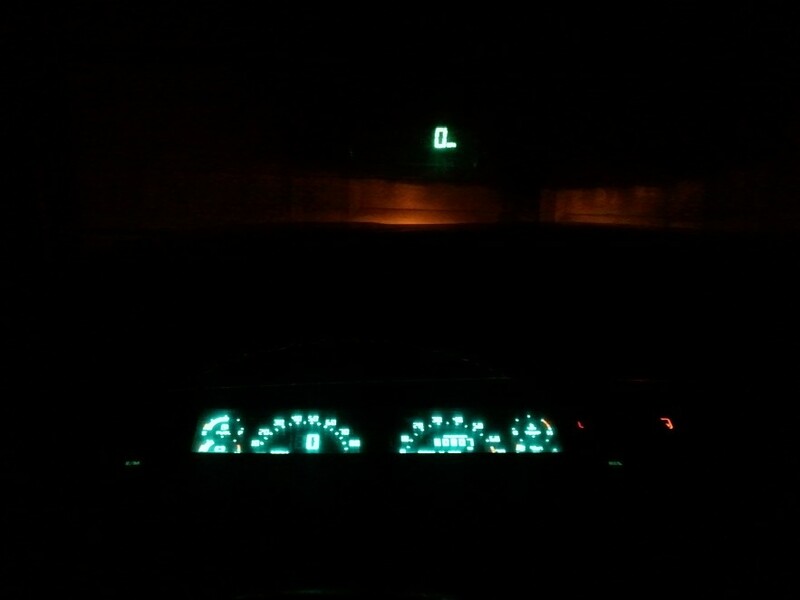 Amistydj grenaded his 95 LQ1 engine redlining the hell out of his engine. Of course in his situation he had a bad pulley and that might have made a lot of difference in the situation. I however also had this issue before (timing belt breaking) on my 94 and it survived even though it was hard as hell to time it. TLDR, LQ1s usually don't grenade themselves if they don't interfere however it can always happen. Playing around the engine bay of the International this morning and noticed that it has an aftermarket radiator cap on it. 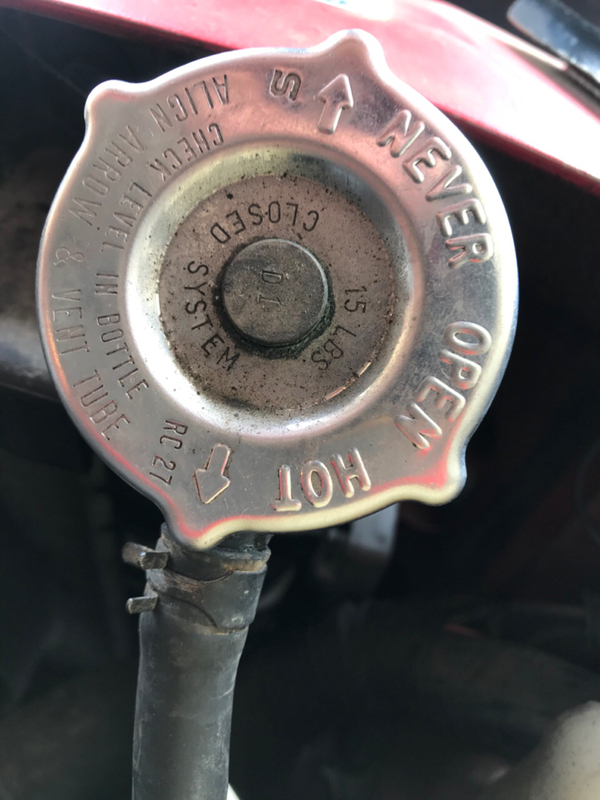 I looked at the 89 International parts car and grabbed what looks like an original cap, not sure, can you guys let me know? I don't know if they used different ones between the 3.1 and the LQ1 cars. The first pic is the cap from a 95 LQ1 and I can validate it is original. The second pic is from a 91 LQ1. I can’t validate the 91 cap is original, but the rest of the car seems too be and it closely resembles the 95 cap, so I believe it is original. Thanks again bud! 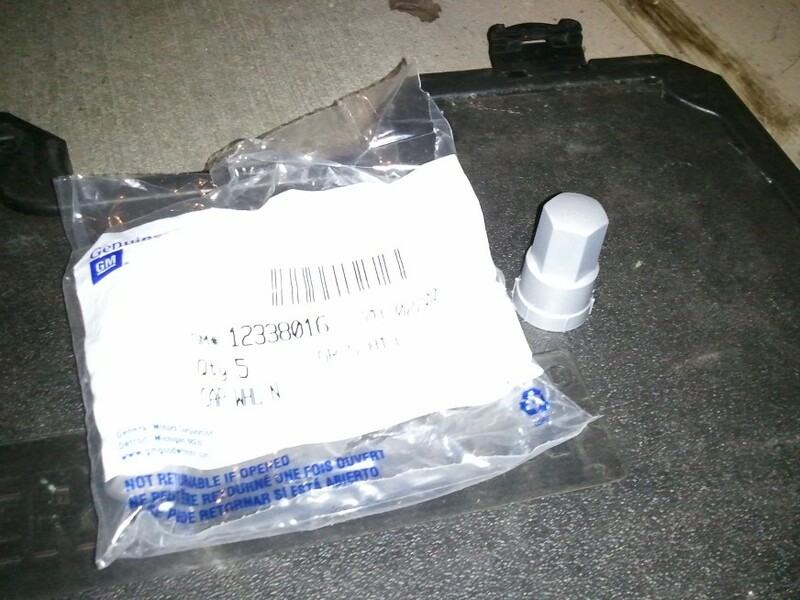 I'm going to keep the plastic OEM looking one, maybe there was a difference between the 3.1 and LQ1 cars and this is just an original 3.1 cap (off of my 89 International coupe 3.1 parts car). I like it a lot better than the obvious aftermarket one. I'm going to look for the ones you posted when I hit the junkyards in the future too. MemphisMan has been helping me out lately with some things to look for on the LQ1's. He's been great and I'm learning a lot. Since I'm new to the game compared to a lot of guys, this may be boring but I'm finding it very interesting. He suggested pulling the front bank cam cover to see if the belt is intact. Things look good so far. The car always turns over strong but not starting up. I was wondering if the motor will turn over if the belt is broken, I have since learned that if the belt is broken it will still crank but seeing the belt intact is a good sign that it's ok for now. I still think the fuel pump is the culprit but I want to get the dash working first. Had a good week and weekend with the International. Got the HUD working, replaced some burnt out bulbs including one license plate light, right rear light on the bumper side behind the rear tire, and the HUD switch lights. The next thing I want to do is get the cluster repaired, switch out the broken driver's side view mirror and power window switch, and work on the factory CD radio. The radio wiring is a mess and the driver's door speaker is missing. There is a broken vacuum line, replace the fuel pump, and then start to figure out how to get her running. The 87 GMC project is still priority but these little fixes on the International keep me motivated to continue when I can. My key in ignition and lights on warning chime isn't working, anyone have any ideas where the noise maker is located? Also, when I tried hooking up my cigarette lighter, it kept blowing the 15 amp courtesy fuse. Got some things working over the last week and weekend on the International, mostly small things like missing bolts and burned out bulbs. I thought it would be cool to take some night pics, one of the many reasons why I love these cars is how they light up at night! The right side license plate light and the little side marker light behind the right rear tire was out. All other lights on the back end including the trunk light work. 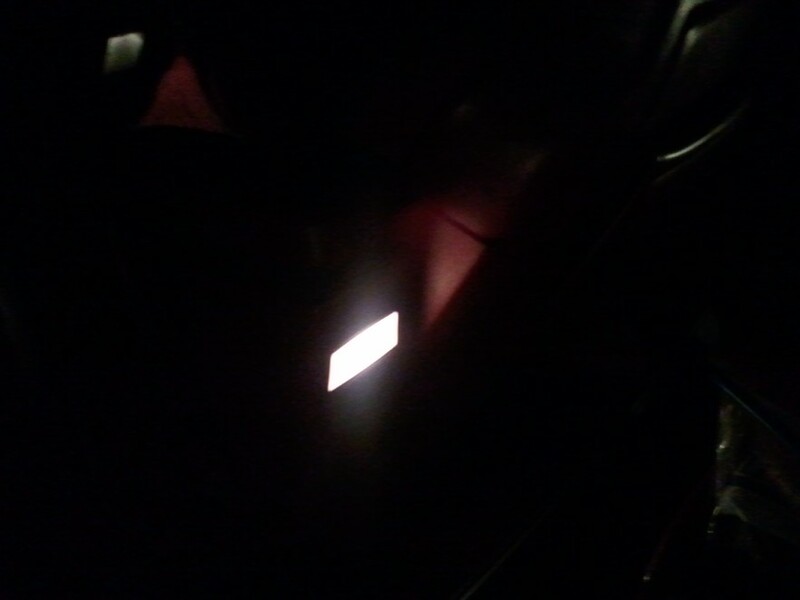 Door switches light up on the passenger side but my phone wasn't picking them up very good. Same for the SWRC's and the front seat controls in the console. 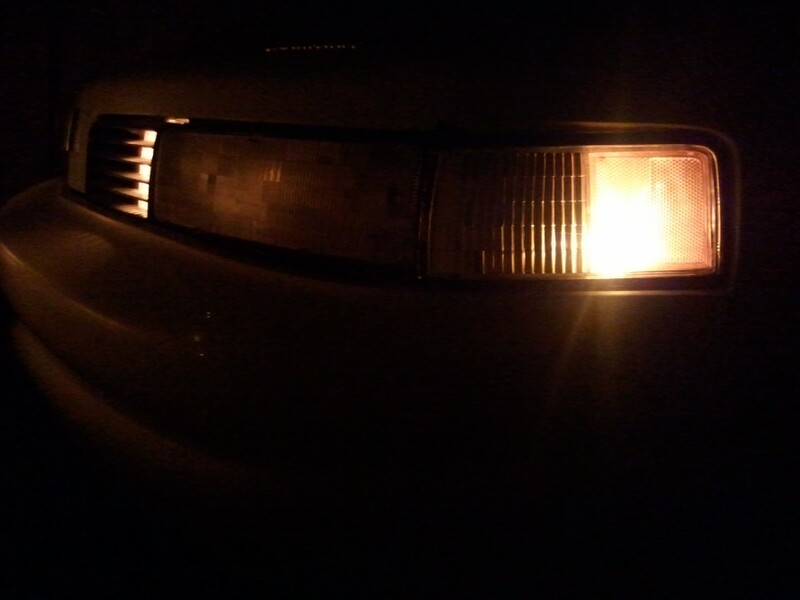 The only light on the drivers door that works is the mirror one, all others are burned out. 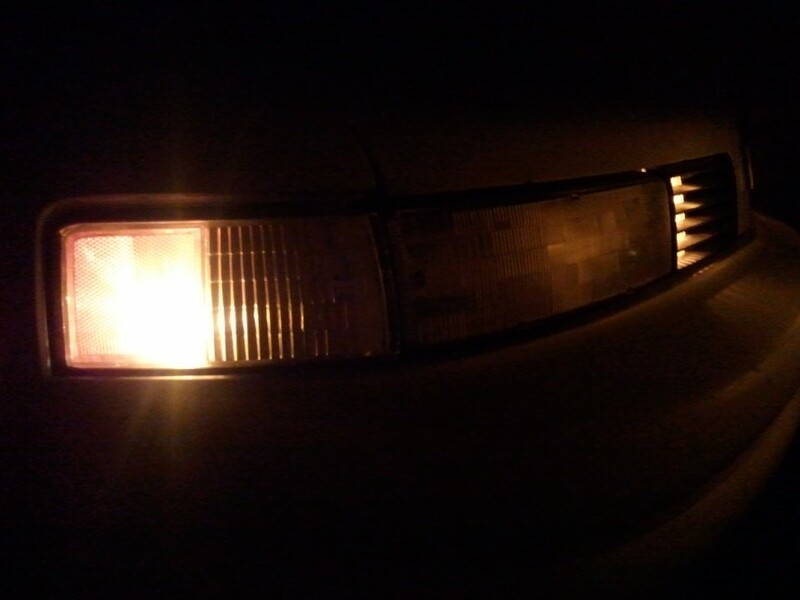 I'm hoping the parts car has a good one or maybe I can replace the bulbs on it, not sure how they work yet. The ECC and HUD switch. They look darker in some spots in the pics but they actually light up really nice and consistent in real life. I had to replace the 4 tiny bulbs in the HUD switch, all burned out. Spare non HUD cluster until I get the original cluster repaired. The original doesn't have the digital 0 since it's a HUD car. I love it! Thanks to MemphisMan, I learned that when changing the rear plugs and wires on the LQ1 cars, people will bend this lip that holds the rubber seal for the hood. Luckily, mine has not been tampered with. 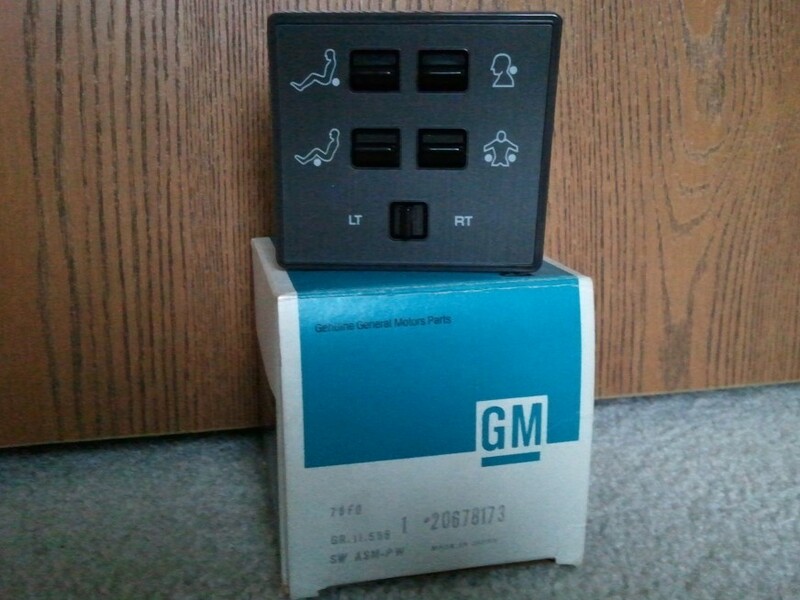 I just got some cool info back from the GM Heritage Center on the 91 International. I want to get as much info as I can including the invoice info. Here's what I found out. Looks like it stickered for $23,619.00 which according to an inflation calculator, equals almost $44,000! Wow! The dealer is still doing business. I'll eventually get the STE invoice info done too. SALES MODEL & FAC. OPTS. THIS INVOICE MAY NOT REFLECT THE DEALER'S ULTIMATE VEHICLE COST, IN VIEW OF FUTURE MANUFACTURER REBATES, ALLOWANCES, INCENTIVES, ETC. THIS MOTOR VEHICLE IS SUBJECT TO A SECURITY INTEREST HELD BY GMAC. I organized my parts inventory for the International and STE. 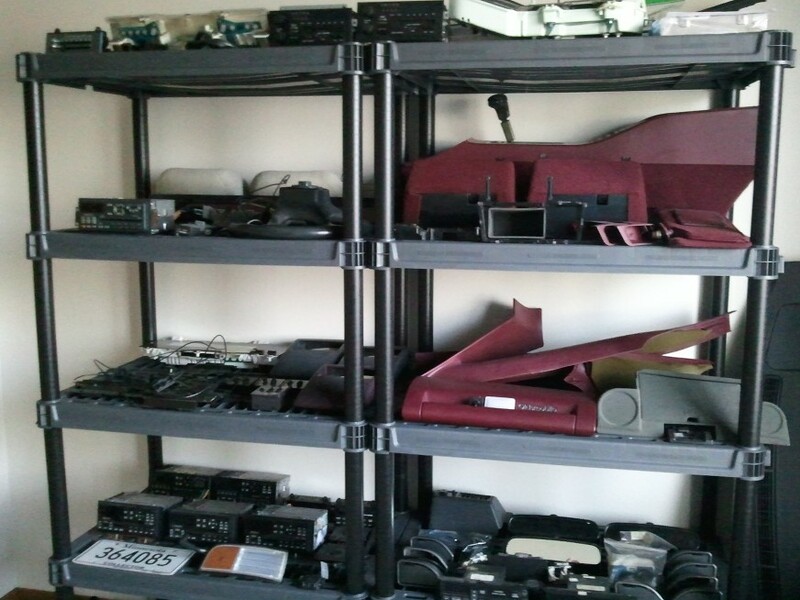 There are a couple of parts for the 87 GMC Sierra 4x4 and a pretty rare 93 Cougar XR7 digital dash. I've become sort of a parts hoarder but figured it was a good chance to gather parts I'll eventually need when the GMC will be done and I can start the restoration process for both of the W's. 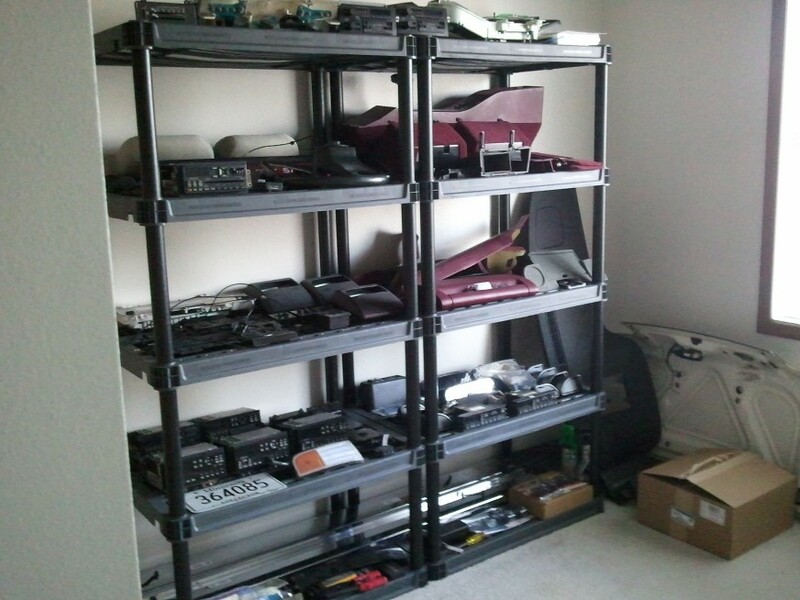 I also have been really busy searching and buying any NOS OEM parts that I can. All this stuff was just sitting on my floor and just got too messy. Assorted CS and STE stuff. GMC and Cougar stuff is on the very top shelf. 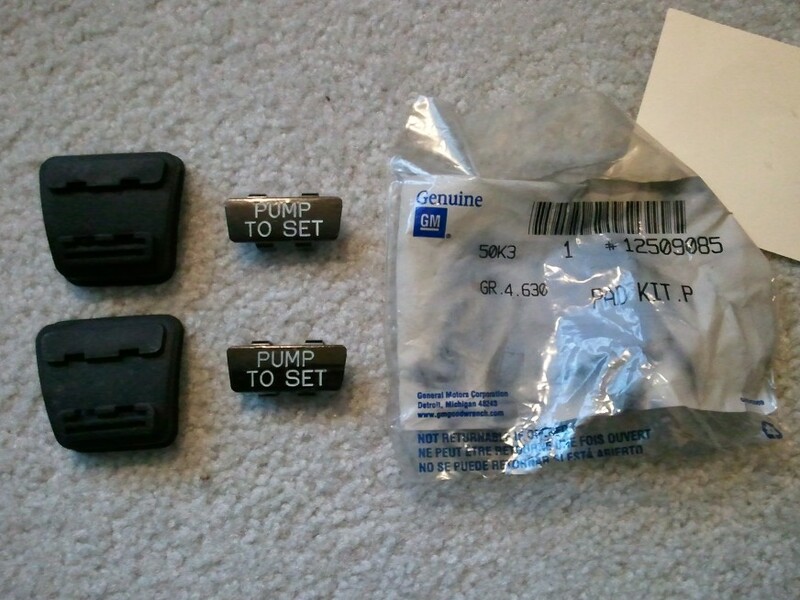 I have extra HUD parts, CD player parts, and interior stuff. Miscellaneous and Super Duty running boards on the bottom. A STE trunk lid with applique and GP HUD dash I got from a couple of great members! 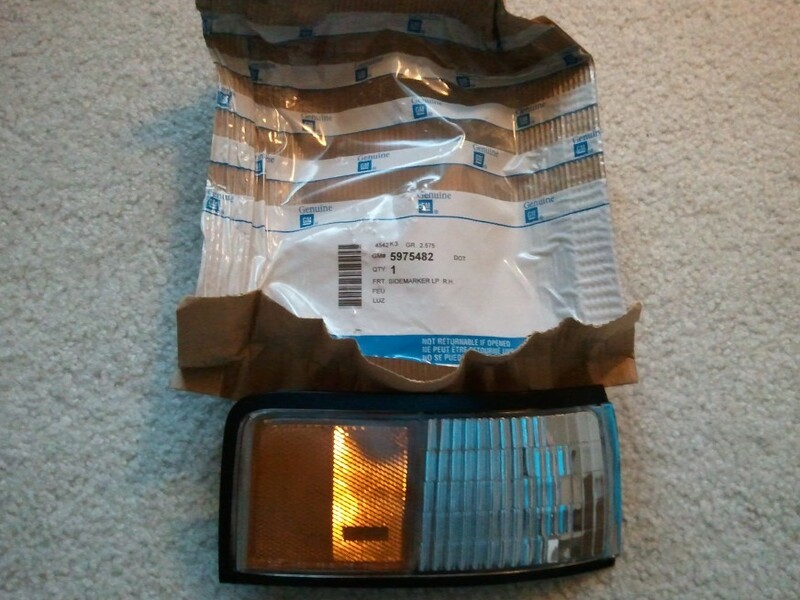 Thanks to MemphisMan, I have a parking lens for the 96 CS coming soon. He's the best! The box contains my new Super Duty steering wheel and SWRC's that the dealer damaged. Haven't installed it yet. NOS OEM parts for both the International and STE. 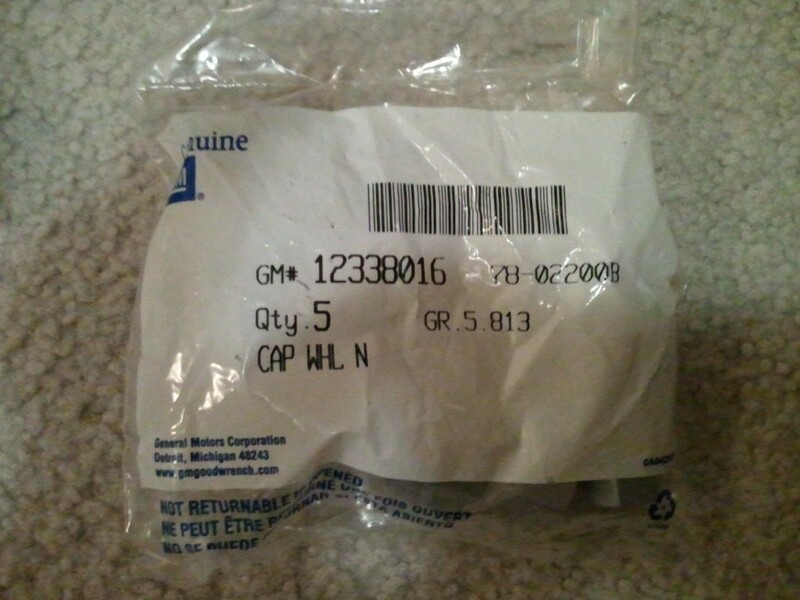 My local GM dealer has been great getting me part #'s and finding them in warehouses across the U.S. and Canada. Don't forget to use your local dealer guys as a resource to find this stuff. 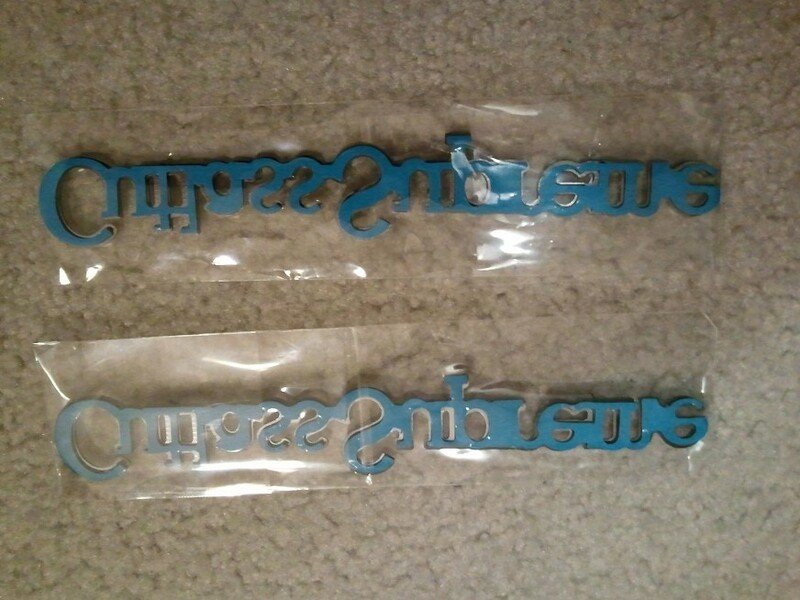 Their not new but very nice used condition door badges. 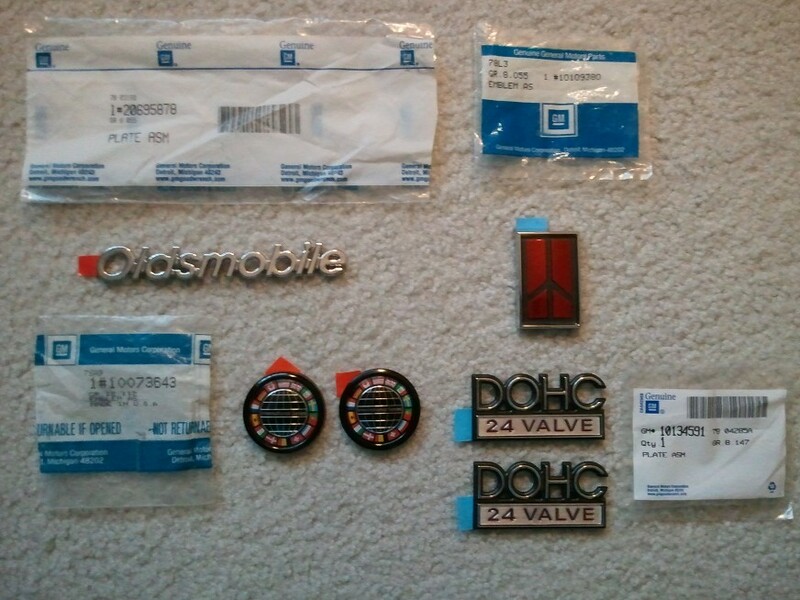 All new stuff, International door badges (I have another one coming for the trunk lid), hood emblem, DOHC fender badges, and red rocket center hood emblem. International coupe parking lens for the right side. I found a NOS one for the driver's side in Canada but sadly, it was cracked. Having a hard time finding another one. Luckily, the original one on the car is still in good shape but would like to find another one. 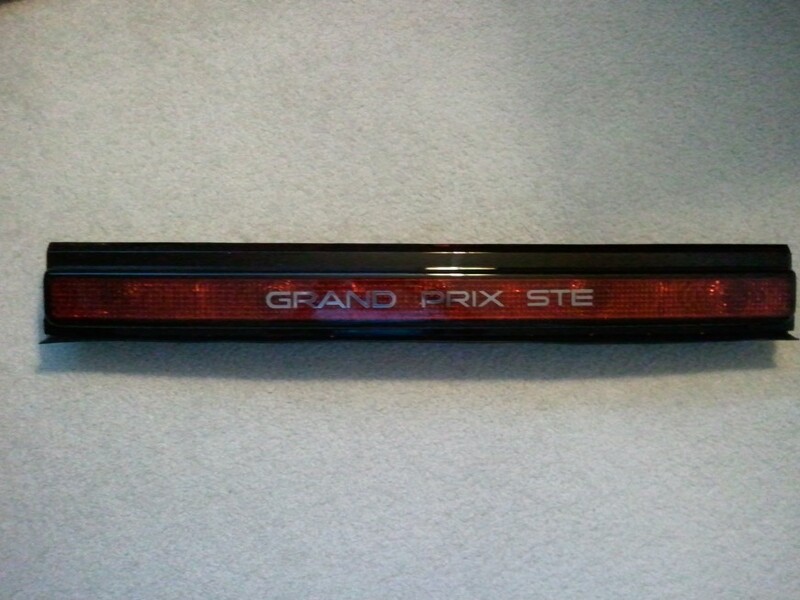 Thanks to Jimmyfloyd, he brought my attention to this NOS STE rear light bar on Ebay. I forgot about it until recently and it just came last night. 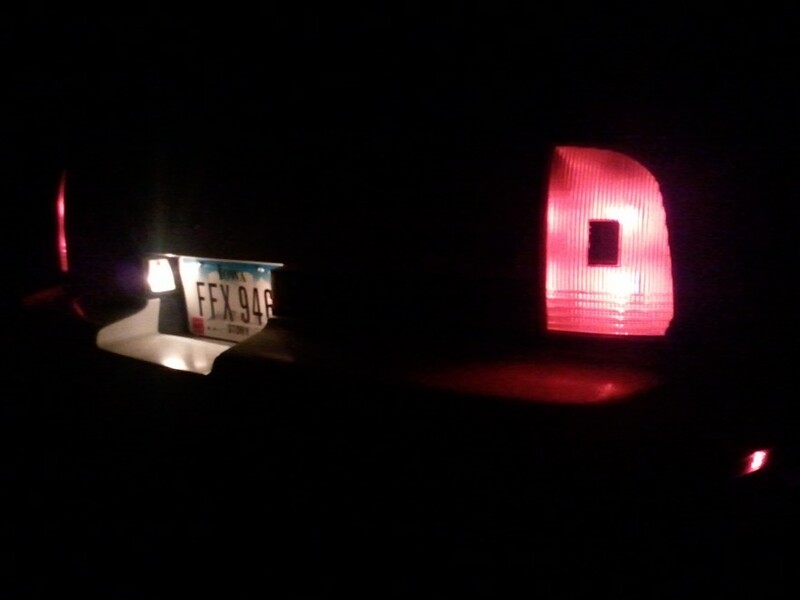 I also ordered NOS right and left tail lights for the STE but they haven't arrived yet. Power driver's seat control switch for the International. Been trying to find these forever! 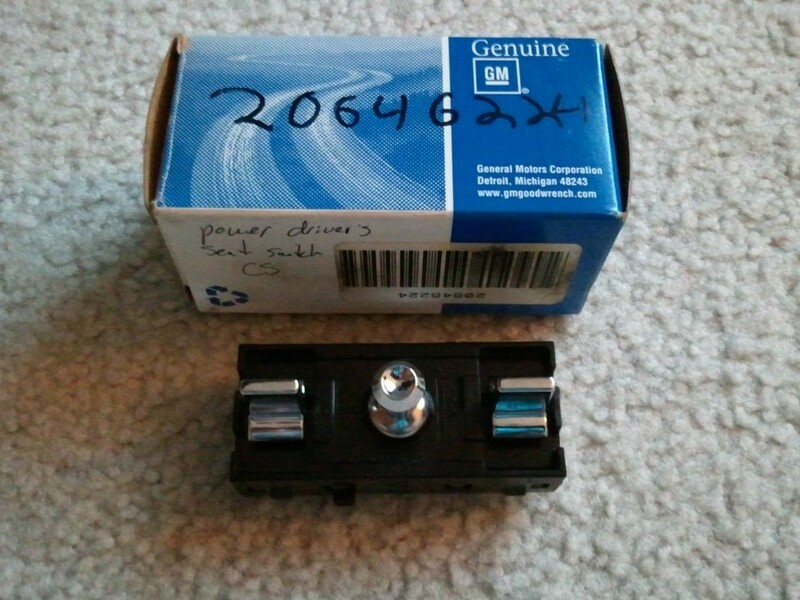 Thanks to Sean1991Olds and the part number he listed on the forum, I found two of them in Canada. HUD switch and cable for the STE! Expensive and also from Canada. Brand new AQ9 console mounted seat controls for the International. I believe it came from Boston, the guy I called couldn't believe they still had it on the shelf. I also found an NOS fog lamp/bass control switch and headlight switch for the International but they haven't been shipped yet. Should get them tomorrow or the middle of this week. 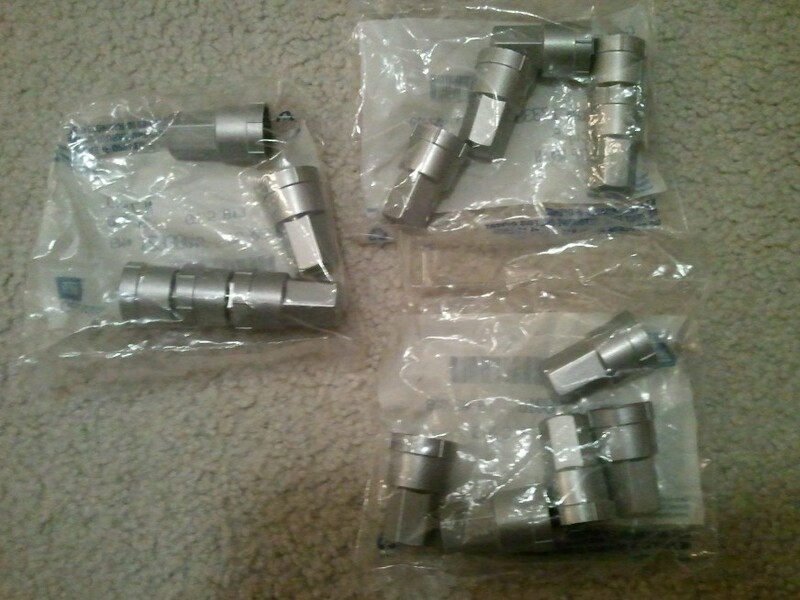 Oh yeah, forgot I ordered a full set of lug nut caps for the International. Found some NOS ones on Ebay. Should be here tomorrow. 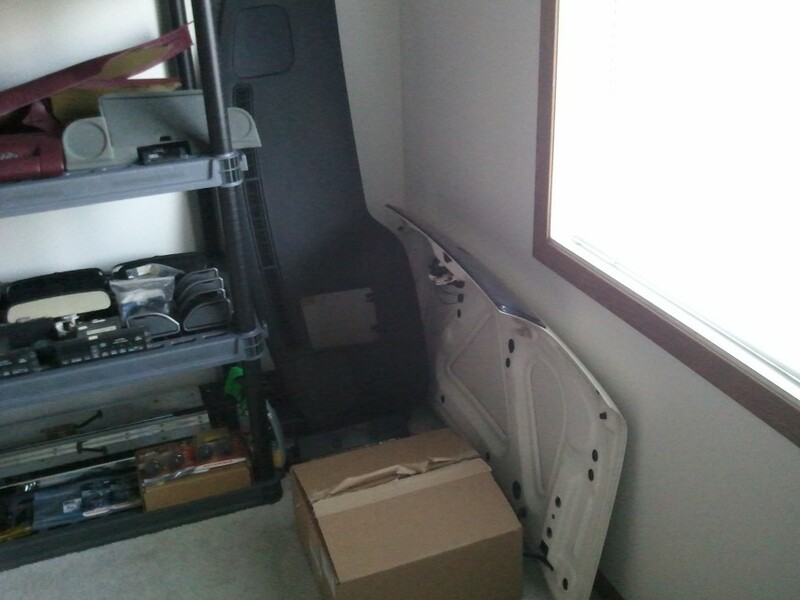 looks like you'll have a great start for hard to find parts for these cars when you start your restore. Thanks for posting these part numbers jiggity. 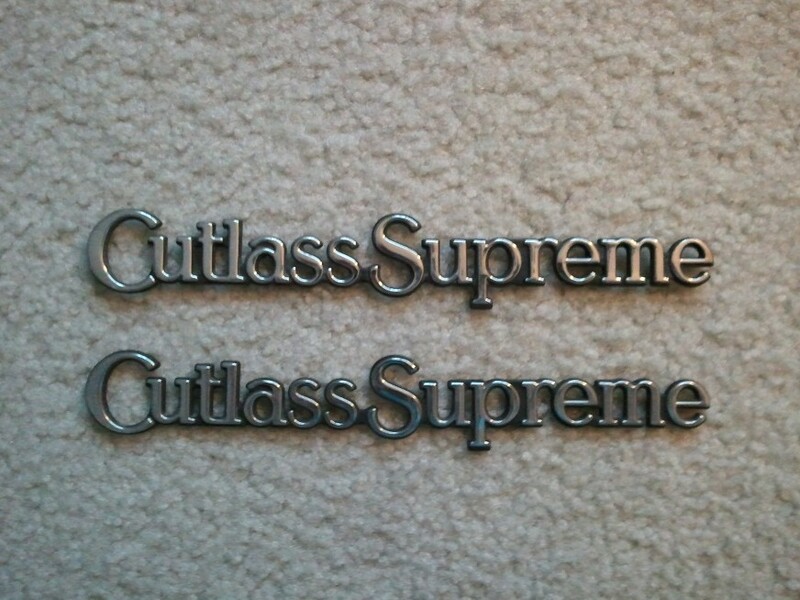 I looked at a similar "Oldsmobile" hood emblem, but the one on my hood appears to be in a different font. 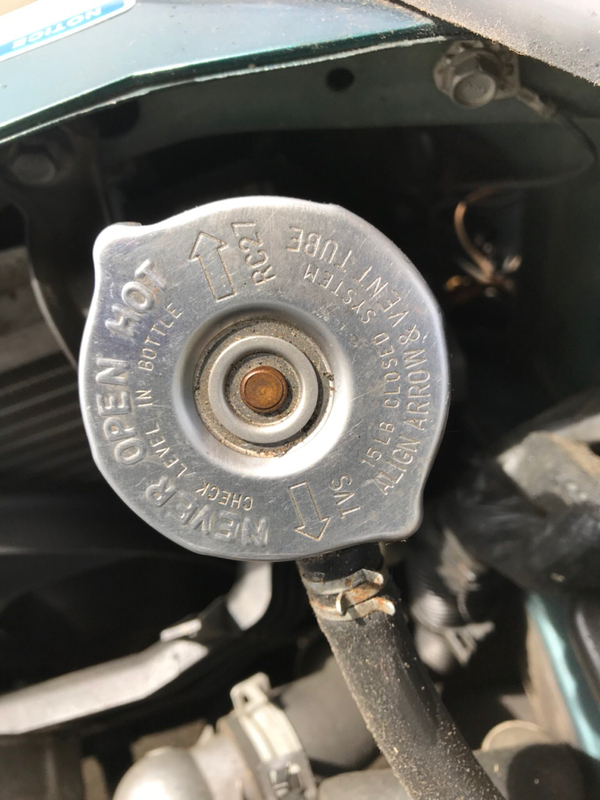 I got some NOS OEM lug nut caps for the 91 International. I realized after looking at the 89 International parts car, the lug nuts on the 91 are not original. Somewhere along the way, the original lug nuts and caps were replaced with these chrome ones and I don't really like the way they look. 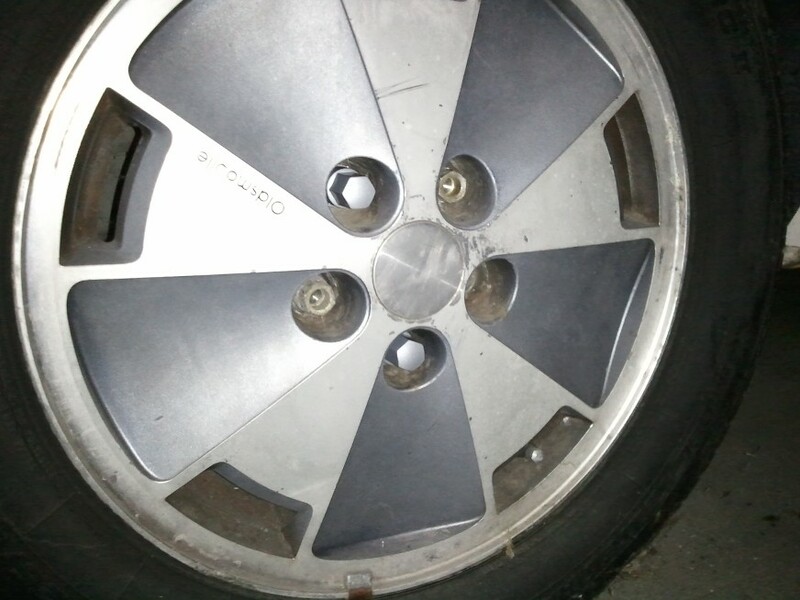 Rear rim with the wrong aftermarket ones. I'm switching out the lug nuts with the parts car that has the original lug nuts I need for the caps to screw onto. 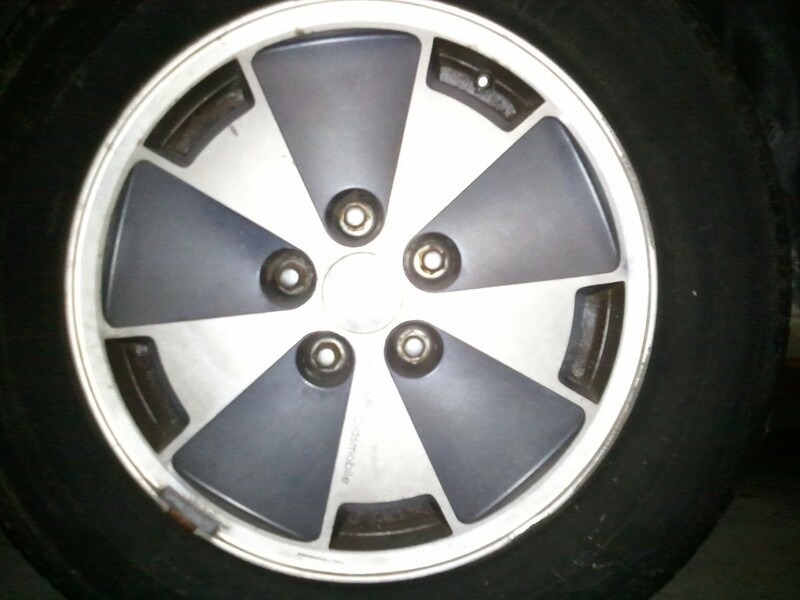 Front rim with the correct lug nuts and caps. I ran out of time but will finish them up soon. Mailman delivered my NOS door emblems while I was gone visiting my folks for Christmas. Very nice! 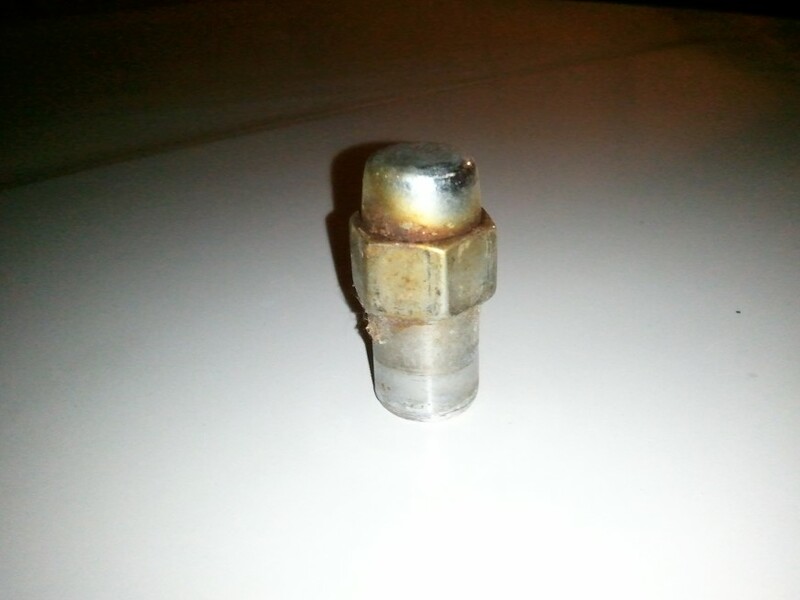 I just finished up changing out all the aftermarket crappy lug nuts on the 91 International and feel really good that I accomplished something productive today. Thanks to Manic, I learned my car had the RPO code PB4 (security lock it, aluminum wheel) and now it has the correct security lug nut, one on each rim and NOS lug nut caps. That's one more little thing I can check off of the list! 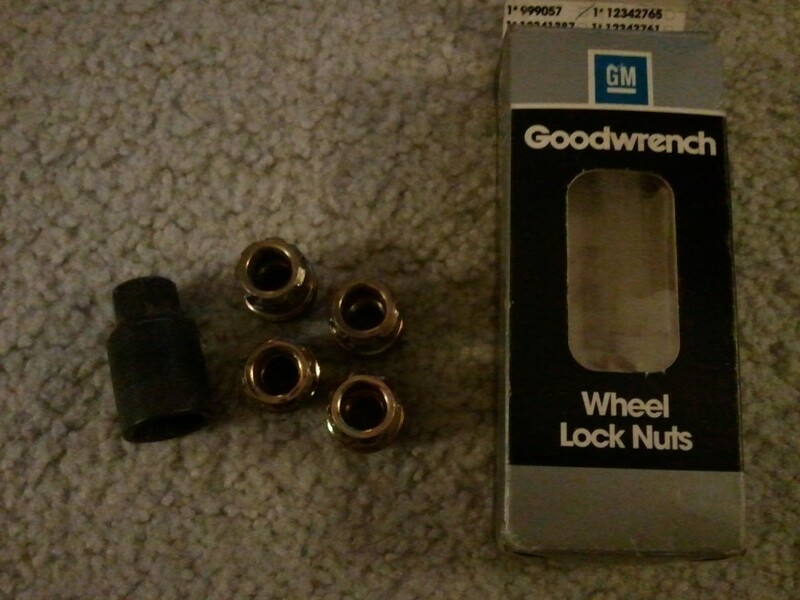 I found this slightly used but in good shape GM kit with the security lug nuts and socket in the original box with the correct part #999057 on Ebay.